About 100 years ago, the first mechanical rabbit began to replace the non-hunting coursing of wild hares (aka Jack Rabbits) in the American west. The inventor of the mechanical rabbit was Owen Patrick Smith (called "Opie" or "O.P." by his friends). Opie Smith was a son of Irish Immigrants, and his father was a mortician in Memphis, Tennessee . Somewhere along the line, O.P. moved west and found himself tapped to run a rabbit coursing even in Hot Springs, South Dakota. Greyhounds had been imported to the American West in the middle of the 19th Century, and the standard set up back then was for two dogs to be held back while a rabbit was tossed from a bag to run. O.P. liked watching the rabbits run, but he did not like the noise when the jack rabbits were caught. "When the dogs got it, the rabbit screamed like a baby," Murray Kemp, president and general manager of the Multnomah Kennel Club track in Portland, Oregon told Sports Illustrated back in 1973. Kemp had been Owen Smith's bookkeeper, chauffeur and confidential assistant. "It really sounds quite a bit like a child's scream." 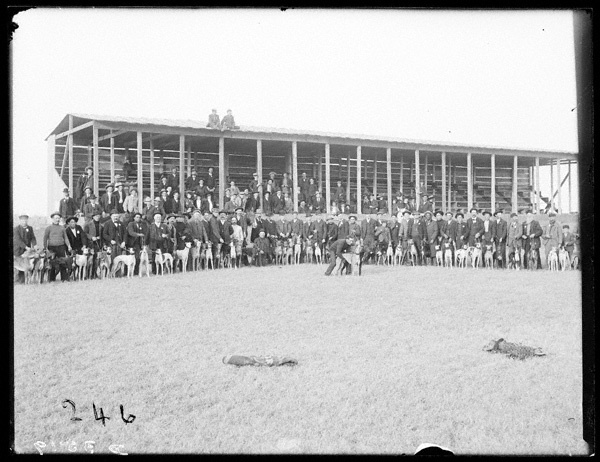 Kearney, Nebraska, 1908, viewing stands. O.P. had an idea -- what if he got a motorcycle and simply pulled a dead rabbit behind it on a rope? That worked -- of a sort. It turned out that the dogs would chase anything that moved, a situation that not every Greyhound owner was eager to salute. After all, if a greyhound would mindlessly and instinctively chase anything, how could anyone talk about their dog being particularly "game?" That particular problem was not O.P. 's concern. By now, he had a larger idea. Suppose he could create an entirely sustainable sport with mechanical rabbits? It would be cheaper to run than horse racing, and it would mean that dog racing tracks could be constructed near cities and in the East. He affixed a taxidermied rabbit to a wooden arm running on straight rails that were concealed in a ditch to the side of thee run. That worked, but there were a lot of mechanical failures due to the fact that the ditch attracted water and too-often shorted out the electronics. In 1910, Smith decided he had figure out most of the mechanical problems, and he obtained a patent for what he called the "Inanimate Hare Conveyor." This was the first of approximately 40 patents that O.P. Smith would take out over the years, as he perfected the sport of electric- and mechanical-rabbit greyhound racing. In 1919, O.P, finally found a financial backer and a location to launch his scheme as a commercial venture. O.P. took lumber from a boxing arena that was being torn down in Oakland, and repurposed it to construct a grandstand for a full-scale dog racing track in Emeryville, California. The Blue Star Amusement Company was now in business, complete with 1,600 pounds of rail and machinery designed to carry a one-pound rabbit around a circular track. The Emoryville track cost $40,000 to put together, but it soon proved to be a financial failure because betting was not allowed in Emoryville. After only a few months, the grandstand and mechanical rails were disassembled and moved to Tulsa, Oklahoma where betting was legal. The Tulsa operation was moderately successful, but Tulsa was hardly a "hot spot," and it was only a year or so before the operation packed up and moved again, this time to East St. Louis, Illinois. Here, a much larger track costing $100,000 was constructed. It was a classic bungle. Too much money was spent on making too big a track and capital costs exceeded income. The East St. Louis track needed 4,000 people at a race to turn a profit, and is generally got half that. In the end, the track went bankrupt within a year. It did not matter. 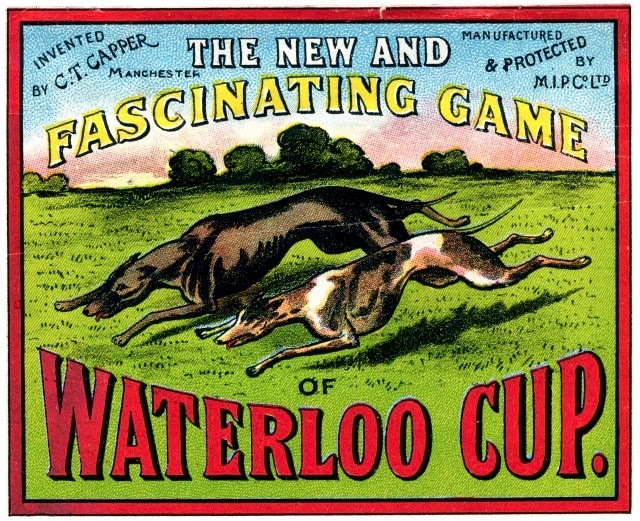 The idea of commercial greyhound racing against mechanical rabbits had caught fire and was being copied, with dog tracks springing up in Florida and in England. By the end of the 1920s, there were a dozen tracks in Florida and 68 tracks operating or under construction throughout the British Isles. Organized crime got into the dog racing game very quickly, and for a very simple reason: it was incredibly easy to fix a race by simply feeding a dog a little too much or too early, or by running it a mile or two before a race, or slipping a little something into its feed. Dog breeders got into the racing game too, with large commercial racing kennels cropping up in Kansas, Texas , Florida and California. 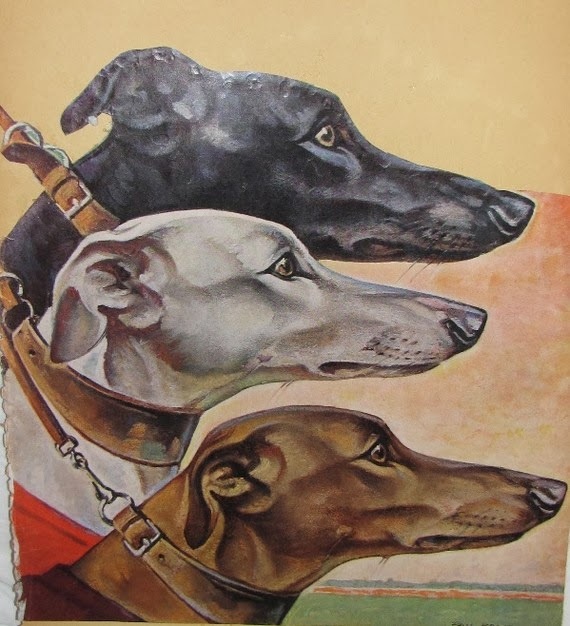 The world of commercial greyhounds tracks and mechanical rabbits has not changed a whole lot since the 1930s. The rabbit, it turns out, does not need to look like a rabbit at all. Some tracks have dogs chasing a bone-shaped bit of wool and plastic, while at least one fog-bound track has dogs chasing an old car tail light. Whatever the lure, the goal of the operator remains the same; to keep the moving object zipping along about 40 feet, or less, in front of the front dog. More than that, and the dogs may break off the chase. It is a scene Franz Kafka would have loved, one in which he would have found some remote parallel to the fate of modern man. The whole enterprise relies on dogs speeding forever after something they cannot possibly catch and which is not even what they think it is; their prey is kept just out of reach by some remote agency they cannot see and whose motives they could not imagine. By early 1990s, greyhound racing in the U.S. was going on at 62 tracks in 19 states, with over $3 billion a year being wagered. Hundreds of thousands of dogs a decade were bred for those 62 tracks, with almost all of the losing dogs and older dogs shot and buried at the end of their "useful" lives, or else sold off to laboratories for animal research. 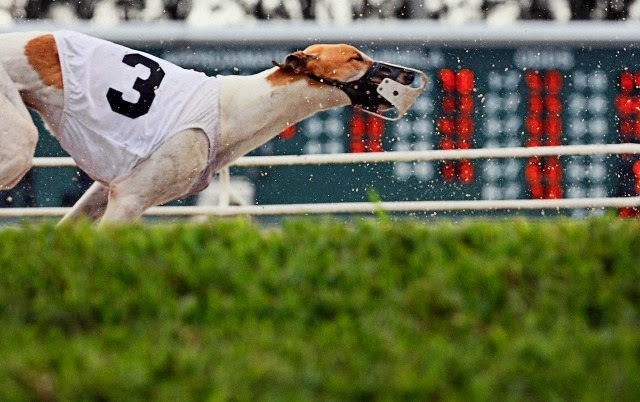 When newspapers got wind of the scope of canine destruction associated with commercial greyhounds racing, legislators moved in, and states began banning dog tracks (only 22 are now open, with 13 of them in Florida), attendance at the remaining tracks declined, and so too did the betting stakes. As more and more failed and retired track dogs were rehomed as pets, a new idea took shape: backyard and open-field lure coursing. How can that be done easily and cheaply? Instead of tying a dead rabbit to the back of a motorcycle, as O.P. Smith had first done back in 1905, the first lure-coursing machines were made from bicycle wheels with string wound on the rims, and a small rabbit pelt pulled through the grass. The Big Leap Forward came when the hand crank was replaced with the starter engine off a truck. The second big leap forward came when pulleys were attached to stakes set in the field, so that the string could be operated as a continuous zig-zag loop. 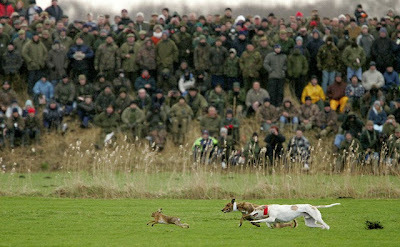 Here was mechanical "open-field coursing" in which nothing died, and a disabling rip from barbed wire was never going to be a worry. I remember seeing one of the first modern lure-coursing rigs being operated in the early 1980s, and trying it out with two of my terriers back then. It turns out that a white fluttering plastic bag is about all that is needed to get a dog -- almost any dog -- running like the wind. 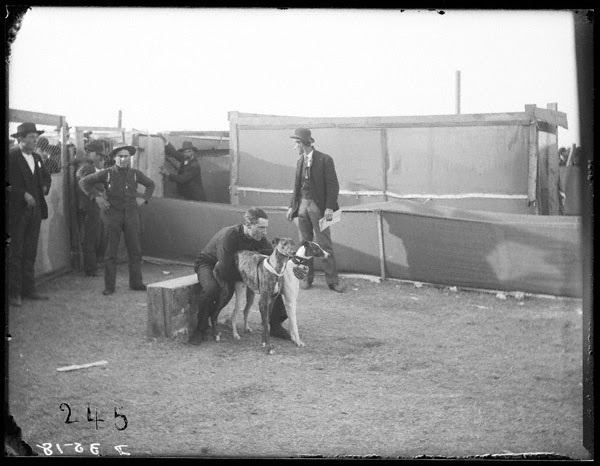 Today, lure coursing rigs are not only used by greyhound and other running dog enthusiasts, but also by zoos giving exercise to Cheetahs and Wild Dogs (as well as a bit of entertainment for visitors). Modified lure coursing rigs have also been used to exercise large hawks and eagles in wildlife parks and sanctuaries. 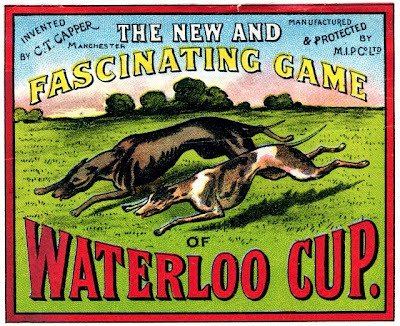 The Waterloo Cup -- a canned hunt as spectacle, now banned. Canned hunts and trophy and ribbon chases with live animals have fallen out of favor, and are now banned in much of the world. At the same time, the tremendous "churn and burn" of dogs by organized tracks employing big dollar mechanical rabbit machines is now under fire. What is not under fire, however, is simple sport hunting with running dogs, or simple low-tech, no-dollar backyard coursing with plastic bag and string. The former feels like hunting because it is hunting. The latter feels like fun for dogs and people, because it is, and unlike the big mechanical rabbit operations at Hialeah, no dead and abandoned dogs are the inevitable, or expected, outcome of the experience. Count that as a win for the dogs and for the people who own them.